Free shipping on orders over $35 from our online store! $8 Flat-rate shipping on all other online sales! 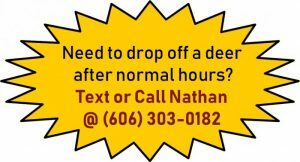 Monday Through Saturday 8am till 5pm for deer drop off and deer pick up. No appointment necessary. CLOSED SUNDAY. If you do get a deer on Sunday, put it on ice and bring it in Monday morning. 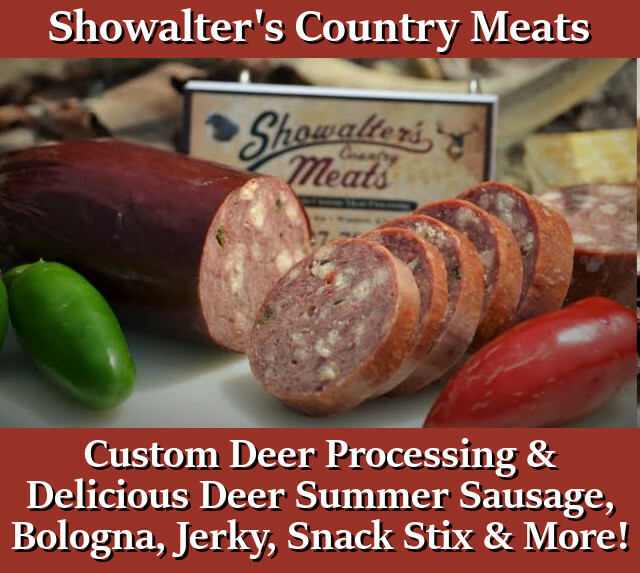 Showalter’s Country Meats is happy to provide professional custom deer processing. 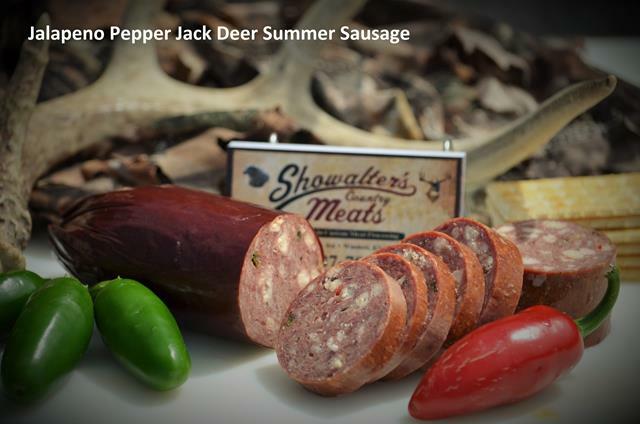 Simply bring us a deer you’ve harvested and we’ll turn it into everything from roasts and hamburger to spicy jalapeno snack stix or savory summer sausage. We take your instructions on cuts and packaging seriously, and are committed to meeting your exact specifications every time. 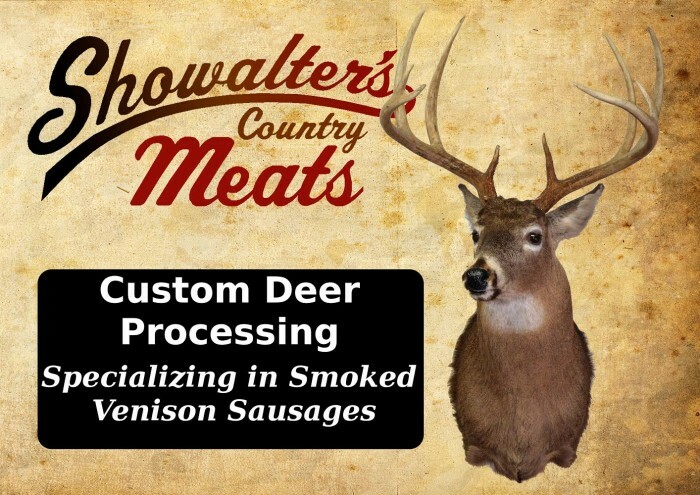 Below you’ll find information about our rates and policies, a deer processing form you can download and print out, as well as information about how we’ll process your deer, and what we need you to do before we can. 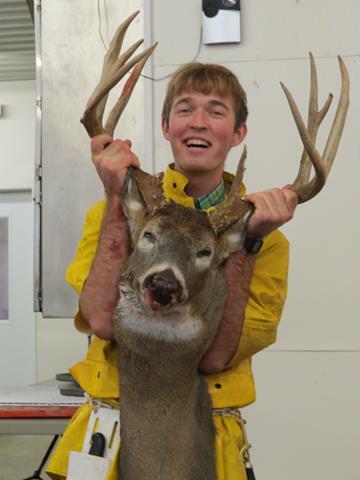 If you have any questions about our deer processing services, please Contact Us. Want to Donate your deer to feed the hungry? Please Bring you deer to us field dressed. Please do NOT skin your deer. When this is done in the field the meat often ends up dirty. Bring us your deer already de-boned! 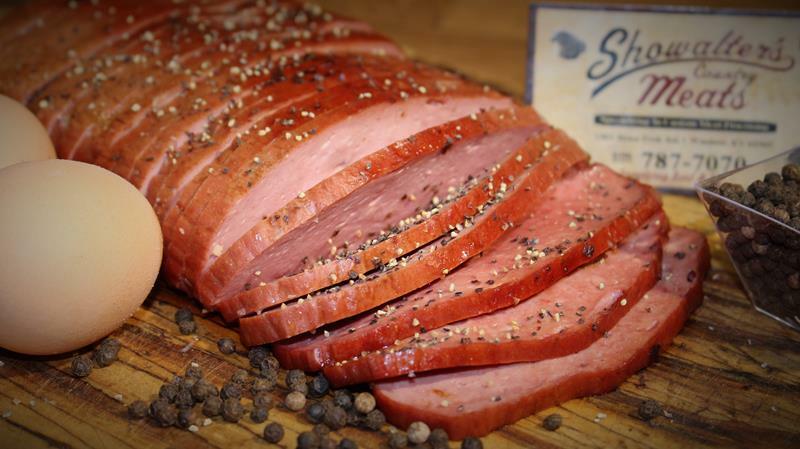 Smoked, fully-cooked, and ready to enjoy! 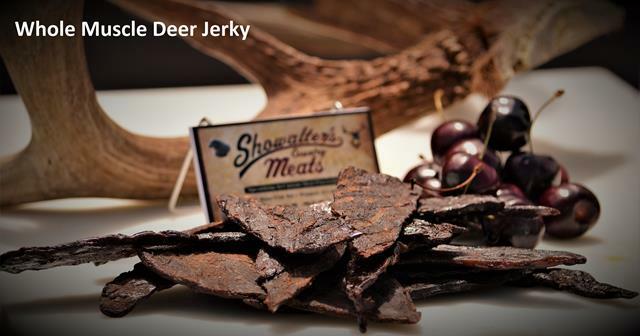 Try our delicious new deer bacon! Don’t miss out on some of our other delectable deer treats! 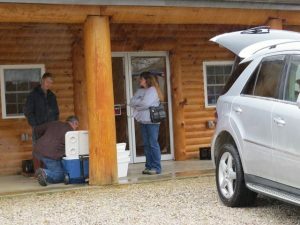 What is involved in getting us to process your deer? After you successfully bag your game, bring your deer and it’s confirmation number to us for processing. At our front desk you can tell us how you want your deer butchered and what products you want out of it (roasts, burger, sausage, snack stix, etc). 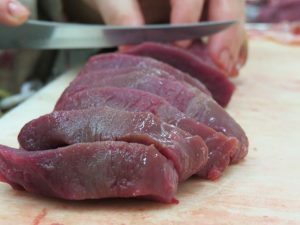 If you’re not sure how you want your deer processed, we’ll be happy to guide you through the options. Once the paperwork is done, you will be given a tag with your name. Because the animal you bring in is the meat you take home*, this tag helps us ensure your deer remains your deer the whole way through processing. Simply give this tag to the guys who unload your deer when you pull around to the side garage door – they’ll take care of the rest. 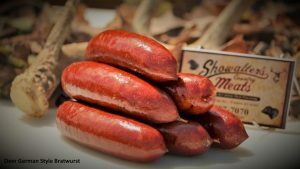 *This does not include your cooked meat options such as summer sausages, bratwursts, bacon, etc. If you harvested a buck but don’t want it caped out to be mounted, you can get the guys at the garage door to remove the antlers for you on the spot. Take those antlers home with you, right away. 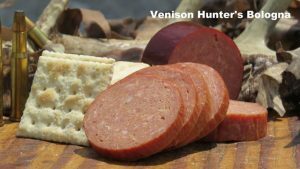 That is all you need to worry about – except of course to come back and pick up your delicious venison products when we have it finished! Now the process of turning that big buck you bagged into lean steaks and tasty treats begins. We start by skinning your animal. 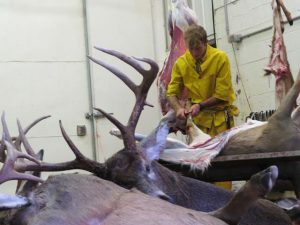 If you specified that you wanted your buck caped out, we’ll do that during the skinning process, and the resulting cape and antlers can be picked up when you get your meat. 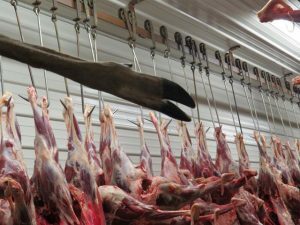 After your deer is skinned and washed down, we get it hanging in our cooler until it’s ready to be turned into whatever combination of burger, venison roasts, deer steaks, sausages, etc. that you specified earlier. 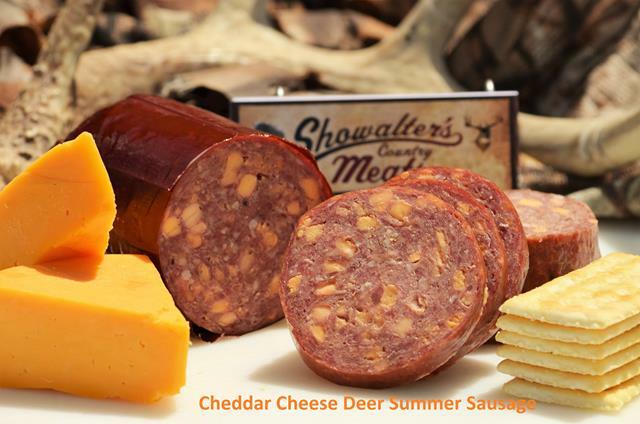 We then package and label your deer meat and bring it to our freezer. Then we’ll give you a call to let you know that your venison is ready to be picked up. 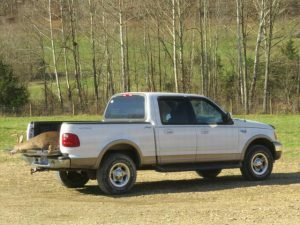 Normally it will be about 10 days from when you drop off a deer till the we have it ready for you to come get it. 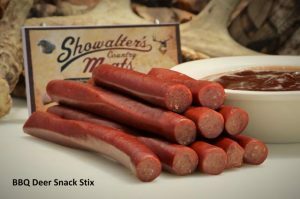 Because freezer space is in high demand during deer season, we kindly ask that you make sure to pick up your meat within 3 days of us letting you know it’s ready. For Youth Hunting, Black Powder, and Modern gun season we are available for drop off from 8am till about 9pm.